With SCENT OF MAGIC being released today, I'd thought I'd squeeze in a bunch of local book signings this weekend to help promote the book and to take advantage of the holiday rush. While I would love to travel all over the world to meet my readers, I'm staying close to home during this busy time of year. Sorry about that! I'm posting my schedule below just in case you happen to be in central PA this weekend or in early January :) Or think you'd like to take a road trip and come hang out and chat with me. I'm also posting it because not everyone gets my newsletter or opens it right away (I know - hard to believe isn't it?). December 21, 2012 Book Signing at http://store-locator.barnesandnoble.com/store/2916 Barnes & Noble Booksellers (Red Rose Commons, 1700 H Fruitville Pike, Lancaster, Pennsylvania, 17601, 717-290-8171). 6:00 p.m. to 8:00 p.m.
Week 1 of the SCENT OF MAGIC blog tour started on Monday. My publisher is giving away an amazing prize package and you can enter to win this at any of these stops (US/Canada only), and you can win a copy of SCENT OF MAGIC at these stops as well - a few are open to international readers (see below). EXCLUSIVE SCENT OF MAGIC BOOK TRAILER! Yes, lots of shouty capitals - but the UK office of MIRA Books just posted a brilliant video trailer for SCENT OF MAGIC. They produced the one for TOUCH OF POWER last year and this one is just as fabulous! It's just a one minute video to help promote the book. 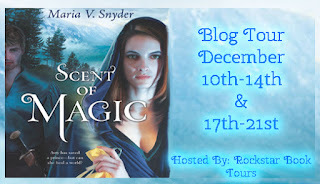 10 Chances to Win - Scent of Magic Blog Tour! Well the title pretty much sums it up - I'm promoting the soon-to-be released SCENT OF MAGIC, book 2 in my Healer Series. It's due out December 18th in the USA, Canada, UK and Australia/New Zealand. The Blog tour has a number of fun posts - A guest post by Belen being one, and my Christmas traditions being another. There will be reviews, an interview, a podcast and a chance to win a free copy of SCENT OF MAGIC at every stop. A couple blogs will be open to international readers for a chance to win. The Farm Author Interview + Giveaways! It is my pleasure to introduce to you Emily McKay, author of THE FARM. It's a YA post-apocalyptic story with these creatures called Ticks (very similar to vampires). She asked me to read her book back in the summer for a cover blurb and I LOVED it! My blurb was something like this: Be prepared to stay up all night - I did! The main characters, Lily and Mel are very unique and likable. The plot is different enough to stand out among the current wave of dystopians/post-apocalyptic novels. Below is a fascinating interview with Emily and she is also offering two prizes as giveaways. One is a signed copy of THE FARM and the other is a Vampire Apocalypse Survival Kit. The giveaway is open to everyone (yes, including international). To enter, post a comment to this blog by December 11th, 11:59 p.m. EST and please include an email addy so we can contact you!